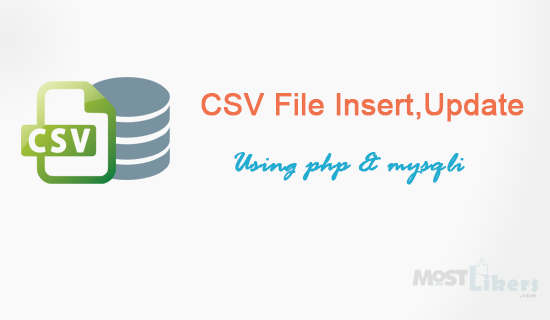 In this post, we will discuss on how to insert and update bulk CSV file data into the database. This tutorial help with bulk product upload,bulk data upload website users. Because they need to insert and update large data daily. Just inserting data one by one is very difficult and time consuming also more process. So, I would suggest like website follow this script you can easily upload more data to the database. For using this you must create one example CSV sheet based on your database column. Here I have created sample shopping cart website product table. We need to create 'products' table into the database with following structure. Create sample csv file based on the products table column name and insert product information data to that csv file. Id - Autoincrement so no need gives that column data. Sku_id - Unique id (like product unique identify id). Create config.php file write database connection code to this file. The above form action file insert_data.php and enctype="multipart/form-data" it will encrypt the form data to post the another page. fgetcsv() - Gets line from file pointer and parse for CSV fields, This function will check the CSV files array fields success or Failure. fgetcsv($handle,1000) - Count the total keys in the row. The output of products table. Create a new file name called update_data.php write and follow the below code. CSV file Insert and update both code almost same. we need to check inserted data based on sku_id(unique id) . Sku_id already exist the table then only allow to update the data. mysqli_num_rows() - Returns the number of rows in the result set. if the $count==1 the data already exist.